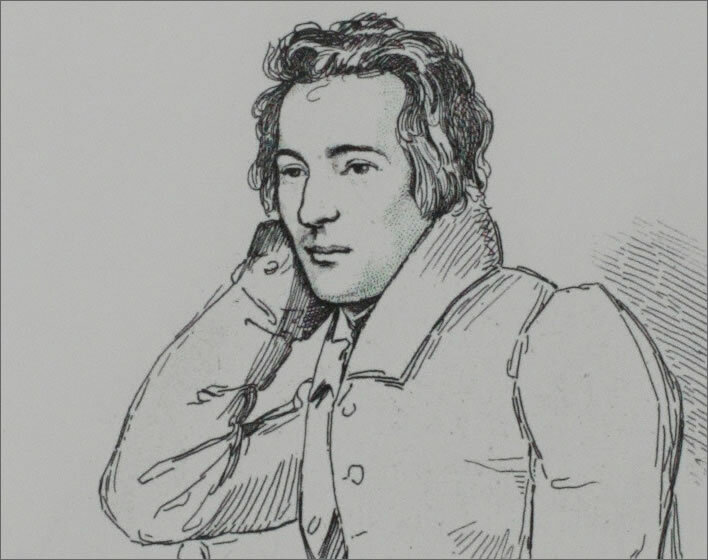 Let's mark the anniversary a month ago – yes, we're late again – of the 160th anniversary of Heinrich Heine's death in exile in Paris on 17 February 1856. The pleasure of Heine, his humour and satire, have been largely reserved for readers of German. If one needed only a single reason to learn German, then that reason would be to be able to read Heine's works in the original. Were he better known in the English-speaking world the canard about the serious Germans having 'no sense of humour' would never have become so current. He had not much reason for humour about his life, which makes his witty irony all the more remarkable. By the time he published his book of poetry Romanzero in 1854, two years before his death, he had already been suffering a long dying. 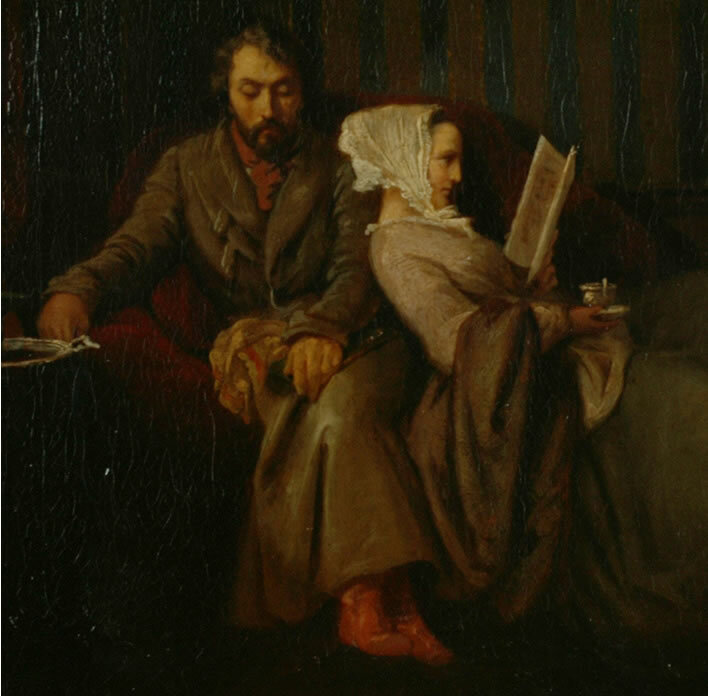 We moderns are curious to know from what exactly he was suffering and where it fits into our slightly more exact modern scheme of misery, but there is no certainty: some say syphilis, some tuberculosis, others multiple sclerosis – perhaps all of them. Let Harry Heine tell you in his own way in these excerpts from his postscript to Romanzero, written in his Matratzengruft, his 'mattress-grave'. Heine used this postscript to respond to those who assumed that, faced with death, he would grow more religious. Happier days: the 32 year-old Heinrich Heine in an etching by Eduard Mandel (1810-1882) from a drawing by Franz Kugler (1808-1858), 1829. Heinrich-Heine-Institut, Düsseldorf. At that time  I still had some flesh and heathenism on me and was not yet become that emaciated spiritualistic skeleton that struggles against its complete dissolution. But do I really still exist? My body is so decrepit that nothing more remains apart from my voice. My bed reminds me of the grave of Merlin the magician in the murmering forest of Brocéliande in Brittany, under the tall oaks whose tops stretch skywards like green flames. Oh, colleague Merlin, how I envy you those tall trees and their fresh breezes, for no green leaf whispers into my mattress-grave in Paris, where from dawn to dusk I only hear wagons rattling past, hammering, people arguing and tinkling on pianos. An unquiet grave, death without the privileges of the dead, who don't need to spend money and don't need to write letters and books – that is a sad state. It leaves its mark, dying. Heinrich Heine in the 'mattress-grave'. 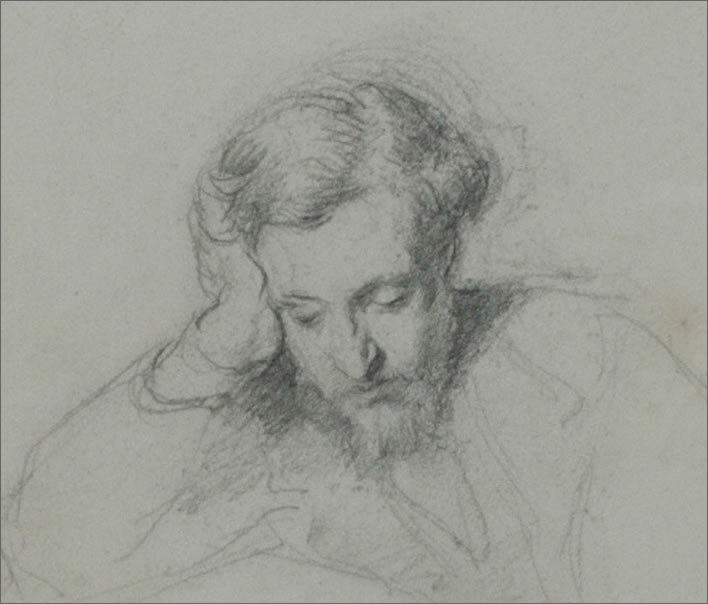 Pencil drawing by Marcellin Gilbert Desboutins (1823-1902), 1853. Heinrich-Heine-Institut, Düsseldorf. Some time ago I was measured for my coffin and for my obituary, but I am dying so slowly that such things are becoming boring, for me as well as for my friends. But patience – everything comes to an end. One morning you will find the booth where you enjoyed the puppet shows of my humour closed. The author finally gets to know his public, as though it were a rational being. Even you, my readers, seem to be sad that I must say farewell to you; you are moved, my dear readers, and precious pearls fall from your tear ducts. But just stay calm: we will meet again in a better world, where I expect to be able to write better books for you. I assume that my health will improve and that Swedenborg has not deceived me. He tells us with great confidence that we will calmly continue doing in the other world all the things we are doing in this world. Our personality will stay the same and death will not produce any great disruption to our bodily development. Swedenborg is a thoroughly honest chap and his reports of the other world are credible, where he saw with his own eyes some notable people. Most of them, he tells us, remain unchanged and occupy themselves with the same things with which they occupied themselves previously. They remain stationary, agèd rococo, which seems very amusing. So, for example, our dear Dr Martin Luther was interrupted while writing his Doctrine of Mercy, so that every day for three hundred years he has written down the same mouldering arguments. Just as the deceased Baron Eckstein for the last 20 years prints the one and the same article which chews over and over the same jesuitical sourdough. But not every notable person was seen by Swedenborg in such a fossilised state. Some had developed their characters extensively in the other world and there were very strange apparitions. The heroes and saints of this earth had become yobs and wastrels, while some went in the opposite direction. 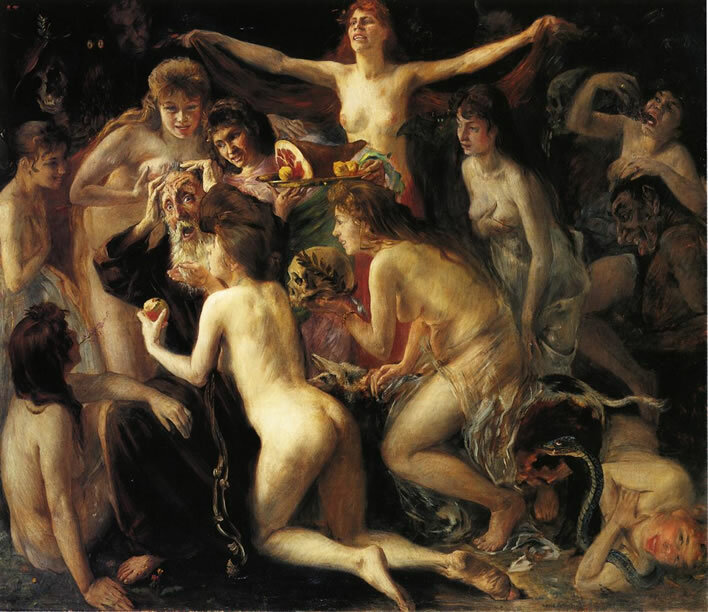 Saint Anthony, for example, driven mad by pride at the tremendous reverence given to him by the whole of Christendom and having withstood the most terrible temptations on earth, has now become an impertinent rascal and outrageous rogue, who competes with his pigs in rolling around in the filth. The chaste Susanna was brought low by the depths of her morality, which she held to be invincible, but which caused her who had so gloriously withstood the elders to fall for the allurements of the young Absalom, the son of David. Guido Reni (1575-1642), Susannah and the Elders, 1620-25. The National Gallery, London, No. NG196. Beautifully realised facial expressions. A story from the Protestant Old Testament Apocrypha (Susannah 15-24) or the Roman Catholic Book of Daniel (chapter 13). Two old men surprise Susannah bathing. When she refuses their advances they publicly accuse her of promiscuity. She is cleared and the elders are put to death. I have no idea why this became such a popular subject for painters. It is easy to be chaste with old men. Absalom, on the contrary, was the son of King David and considered the most handsome man in the kingdom (2 Samuel 14:25). In contrast, Lot's daughters had over time become very virtuous and were models of respectability in the other world. Unfortunately, their father stayed on the wine bottle. 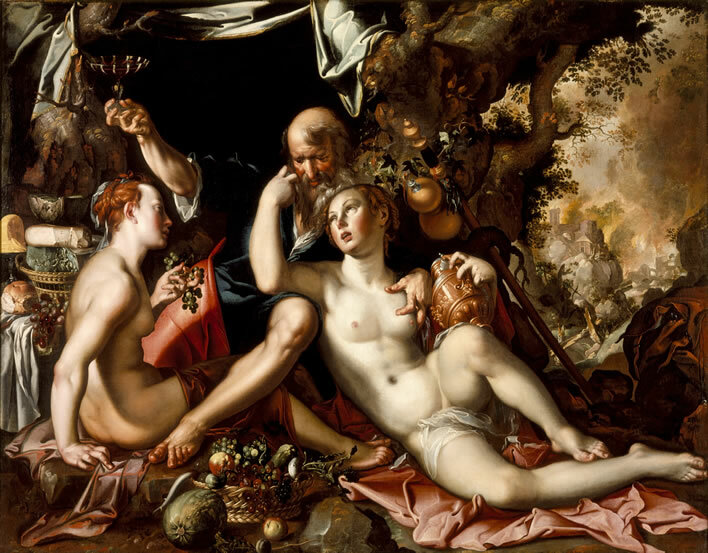 After the flight from the destruction of Sodom and Gomorrah, during which Lot's wife was turned into a pillar of salt, his two daughters got him drunk and seduced him so that they would bear his children (Genesis 11-4, 19). Another puzzlingly popular theme for painters down the ages. In the other world of Swedenborg even the poor Greenlanders will feel at home. They asked the Danish missionaries who were trying to convert them whether there were also seals in the Christian heaven. When told no, they said sadly that the Christian heaven was not suitable for Greenlanders, who could not exist without seals. How our souls resist the thought of the end of our personalities, the eternal obliteration! The horror vacui which is ascribed to Nature is actually much more an inherent aspect of human nature. Be of good cheer, dear reader, there is a continuation after death and in the next world we will also find our seals again. And so, farewell, and if I owe you something, just send me the invoice. Paris, 30 September 1851. Heinrich Heine. Translated into English by the present author from Heinrich Heine Romanzero, Gedichte, 1853 and 1854, 'Nachwort zum Romanzero'. The German text is in Das Heinrich-Heine-Portal.